Now’s the time to plant up a container to brighten your winter months. Many have already done this, keeping up with Monty Don (Gardener’s World) and the nurseries are already running out of plants. However I am only just thinking about this as the geraniums (pelargoniums) have lasted so long this year. I never used to bother with containers, but now I see the point, which is to have something for the season which is more controllable than a whole garden, so you can vary it to make sure it’s always interesting. I started with a chocolate carex grass from the garden centre, and added a bud heather for colour, a red-berried gaultheria and some purple and white violas. As you can see, the bud heather did fade a bit as winter went on. However I was converted, and have used the grass ever since as a starting point for a container. It has had to be divided twice already, however it’s a useful grass to have in a garden, given it’s evergreen and can contrast well with green leaves. I managed to find a whole book of ‘Gardener’s World’ containers, as featured in their magazines. From these and others I offer some principles of container planting for winter, with a couple of examples from GW below. The backbone of a container is an evergreen. This could be a grass, a mini-shrub (M Don seems keen on these and has put a mahonia in his – this will become gigantic, but you can plant it on or discard), a small conifer – the bright green ones are nice with spring bulbs, or an ornamental cabbage. You need something which is bigger than the other plants and provides a structure; it’s usually planted centre back of the pot. berried plants include gaultheria and pernettya, or a skimmia for a bigger display. You can use contrasting leaf textures and shapes as well as or instead of flashes of colour. A flowing grass can contrast with frilly heucheras or an upright phormium, for example. Ivy can flow over the edges of the pot, which is especially useful if the rest of the plants are fairly upright. Here is a pot with a green skimmia and red cyclamen, courtesy of Gardener’s World, and there are several other examples on the site. A step-by-step guide to planting this up can be found here. Another Gardener’s World pot, a variation on the first container – with pinker cyclamen and a bright green heuchera, and the black grass ophiopogon negrescens, in with the skimmia. Planting instructions are here. These containers make such a difference to defy the brownness and dampness all around – and will gleam through any snow that comes our way. 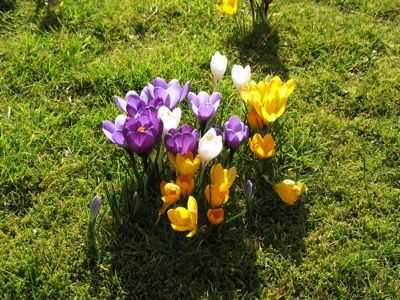 Now is also the time to plant up pots of spring bulbs. I have been doing a ‘bulb lasagne’ pot for a couple of years now, with tulips planted 8in/20cm down, miniature daffodils further up, then crocus near the surface. The tulips did rather disrupt everything when the foliage heaved its way through the compost, blotting out the daffodil flowers, so this year I am going to just use crocus and daffodils, perhaps with a small central plant for interest before they all bloom, and put my tulips in a pot on their own. Sarah Raven, on the other hand, advocates using tulips – see this article. I have a separate pot of iris reticulata ‘Harmony’. They don’t bloom for long, but they are exquisite, and come out at a time of year when little else is in flower to distract your attention, so you can fully appreciate their fragile glory.